Especially in our muscles from strains and sprains, or from our joints through wear and tear as we age or sustain an injury. But its often our ankle joints which cause us pain & discomfort. 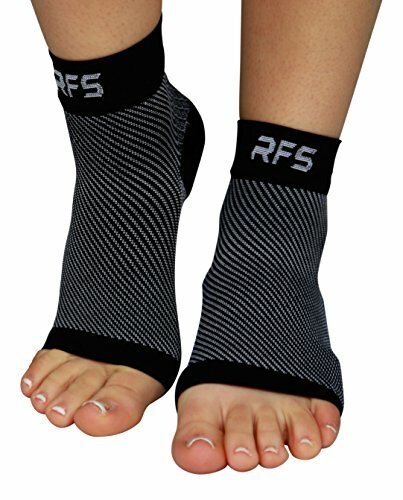 At Run Forever Sports, we designed our ankle sleeves to fit YOUR feet perfectly from day 1! Providing targeted support for people of all ages and levels of fitness. Designed at our USA-based facility to be worn by anyone needing instant relief from joint & muscle pain. We test every product personally to make sure that you receive products that have made the grade in quality and durability. Because we are all different, at Run Forever Sports we designed our Compression Ankle Sleeve to fit feet of all shapes and sizes. To find your correct size, simply measure your ankle circumference around the thickest part of your Arch. For less compression, size up & for more compression, size down. At Run Forever Sports we are proud of our high-quality products and outstanding customer service. If you have any issues with your purchase, let us know and we will put it right - FAST! INSTANT RELIEF & FAST RECOVERY: The Targeted Compression in our Ankle Brace gives instant relief from the Pain & Inflammation of Plantar Fasciitis, Arthritis, Bursitis, Muscle Fatigue, Foot Pain & more. Form Fitting Compression maintains Joint Stability & Oxygenated Blood Circulation is improved giving Faster Recovery, Faster Healing & giving you The Edge in Injury Prevention. REACH YOUR POTENTIAL: From Professional Athletes to Crossfit Enthusiasts, Busy Moms to Active Grandparents, our Ankle Sleeves give Everyone the Support they need to Feel Amazing without affecting Performance. Reach all your Fitness Goals & Stay Active for Longer. Suitable for Men & Women of all ages & fitness levels. HIGH-QUALITY COMPRESSION TECHNOLOGY: Our Specialized Fabric Blend is Designed with our Latest Innovation in 4-Way Stretch Compression Weave, giving you the Perfect Fit with Unparalleled Mobility. Whether you are going out for a Run, going to the Gym, on your Feet at Work all day or Relaxing at Home, our Compression Support Sleeves will surpass All your Expectations. NON-SLIP TRUE FIT: At Last, a Naturally Soft Compression Ankle Sock that Stays Firmly in Place through the Toughest Workouts, giving Superior Support with Outstanding Comfort. Our Ankle Compression Sleeves also boast a Moisture Wicking, Breathable Fabric so your Feet will Stay Fresh, Dry & Odor Free for hours of Continuous Wear. CUSTOMER SATISFACTION: At Run Forever Sports we are Extremely Proud of our High-Quality Products and Outstanding Customer Service. If you have Any issues with your purchase, let us know and we will put it right - FAST! If you have any questions about this product by Run Forever Sports, contact us by completing and submitting the form below. If you are looking for a specif part number, please include it with your message.